With painstaking research, an unerring eye for just the right illustration, and her unique narrative style, award-winning author Ann Bausum makes the history of immigration in America come alive for young people. The story of America has always been shaped by people from all corners of the Earth who came in search of a better life and a brighter future. Immigration remains one of the critical topics in 21st century America, and how our children learn the lessons of the past will shape all our futures. The patriotic stories of hope that shape most immigration books are supplemented here by the lesser-known stories of those denied, detained, and deported. 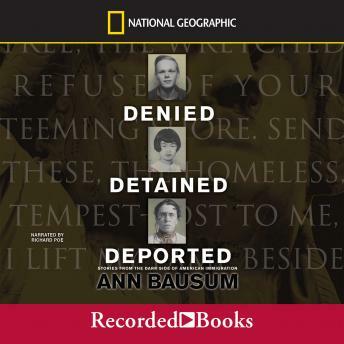 Ann Bausum's compelling book presents a revealing series of snapshots from the dark side of immigration history including: Immigrants Denied: The St. Louis, a ship filled with Jewish refugees from Nazi Germany sought refuge in American ports and was turned away, condemning many of its passengers to ultimately perish in the Holocaust.Immigrants Detained: Japanese-Americans were rounded up during World War II and placed in detention centers-regardless of their patriotism-for security reasons.Immigrants Deported: Emma Goldman was branded a dangerous extremist and sent back to Russia in 1919, after living 30 years in the United States. Ann Bausum creates a bridge from the lessons of the past to the present with fascinating analysis of how our past has influenced modern events and current views on immigration.